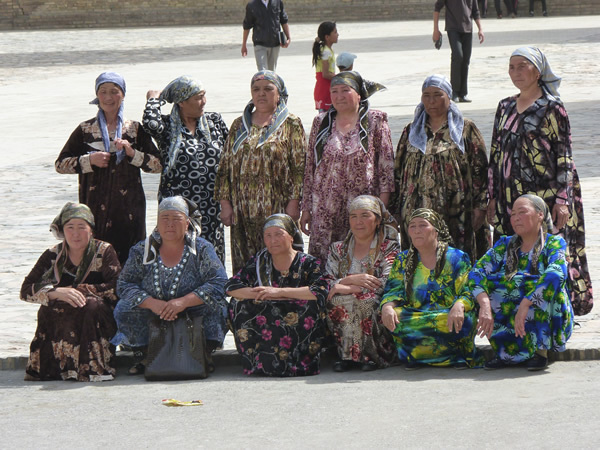 Anyone considering a trip to the Democratic Republic of Uzbekistan should be aware that any country with "Democratic" in it's title generally isn't. They should also be advised that the bureaucratic, time-wasting twaddle you have to go through in the UK to get a visa is worth the trouble as it means you don't meet many tourists from the UK. Presumably this is only until such time as a serious amount of money can be palmed off to the regime. 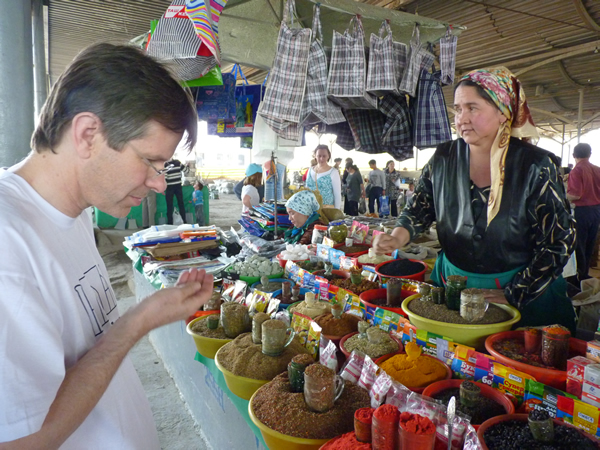 Check out our experiences and visa advice here. 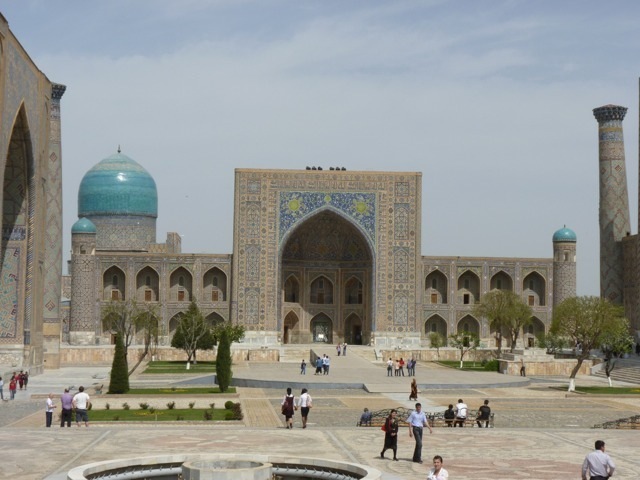 After a relatively comfortable flight, particularly for Simon, Chris H and Pete who wangled business class, on Uzbekistan Airways but involving none of the horrors we had been warned of, we arrived at Tashkent International Airport at 8:30 am. All the talk and fears of sudden diversions to Paris to pick up one of the president's daughters and meals being thrown at us by surly air crew who lock themselves in the toilets to smoke for most of the flight evaporated maybe because we had the British Ambassador on board. 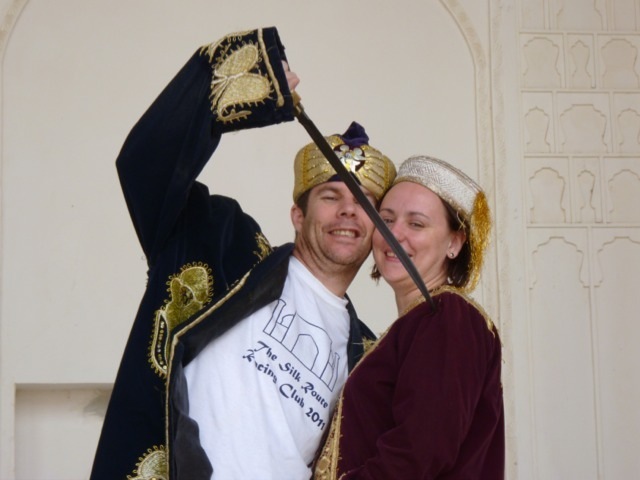 Although we usually know the ambassadors personally and have even had them play on our team, there was no such "Joy" here although a member of his staff, Rustam helped set up the tour with a local friend Umid for which we were very grateful. 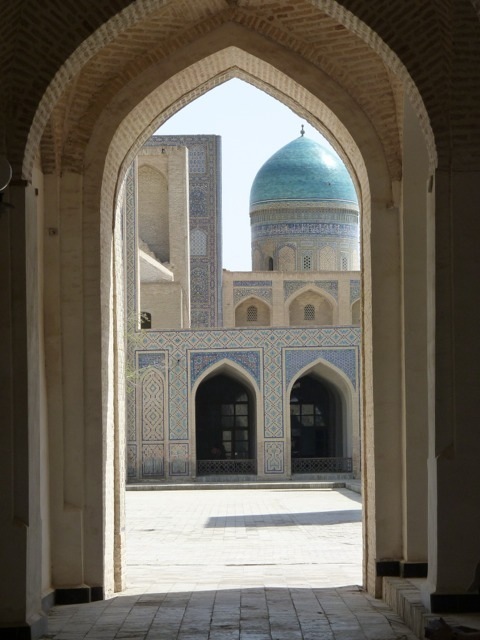 As we had all read ex-ambassador Craig Murray's excellent book "Murder in Samarkand" (blog) it was hard for us not to imagine how wonderful things might have been had he still been there! Upon arrival we had been warned that passport control would take forever rather like the rigmarole involved in obtaining the visas in London. 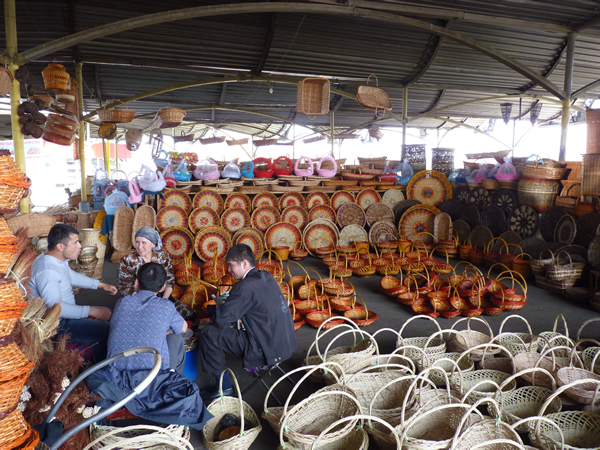 Adding the expected rigorous customs checks and form-filling we were prepared for long and slow progress through the largely deserted airport. Despite the fact that one official kept leaving his post (the one we were mostly lined up at of course) and much stamping of forms in duplicate, we arrived at the Hotel before 10:00am! Within half an hour our sterling/dollars had been switched for wheelbarrows full of Som as highest abomination note 1,000 Sum=30p. Good job the administration has managed to keep inflation at 0% for the last 100 years. Showers and back to the Hotel and by 6:00 at the bar to prepare for the magnificent planned evening out at the prestigious Bahor Restaurant & Club for belly dancing at 9:00. Upon arrival we found the dance floor covered in Russian women and two loud, awful, shouters on stage giving everyone ear-ache. 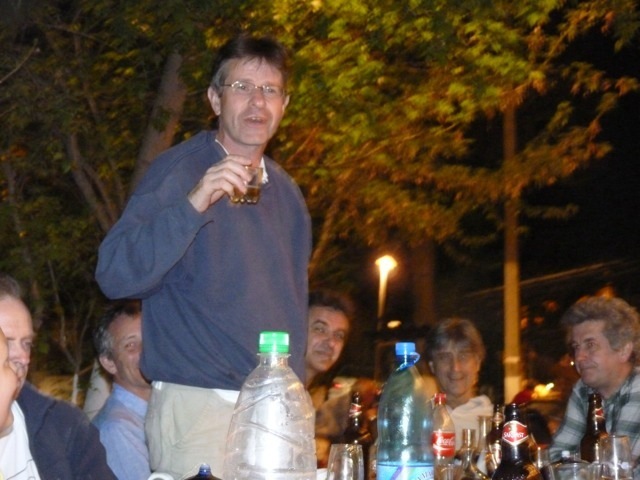 The White wine was interesting - a cross between retsina and aviation fuel. The food was pretty good and probably the best thing about the evening until the lovely belly dancers arrived. Upon leaving some managed to leave our mark in the visitors book as follows: "you have no idea...how enjoyable that was" "oh blimy never again..." "..will we see anything so good" "...even if we live another week." " I really fancied those butch footballers from GB love Yasmin"
Retiring to the hotel bar brought a long day to an end. After an excellent breakfast outside the hotel with an omelette cooked to order, at 10:45 we clambered onto the coach for the agreed 10:15 departure to the racecourse. Simon had checked with the desk the night before and they had looked up the schedule and said two races were planned at 11:00 am. Upon arrival we could see something was missing, no people let alone horses. Even the going looked a bit rough so we got going. 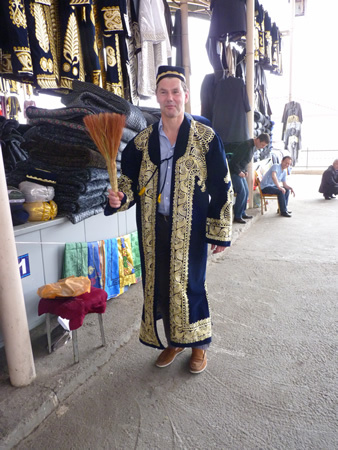 The coach driver kindly dropped us near the market where we had a wonderful time wandering around tasting all the comestibles and trying on all the clothes. 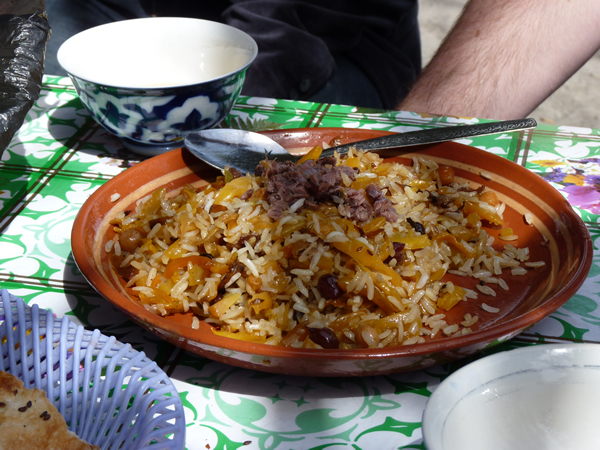 Lunch was Kebabs and Plov (a rice dish with veg and topped with some meat). Plov was clearly named after Pavlov's dog as every restaurant had a picture of it outside but, having got our saliva going, there was nyet. 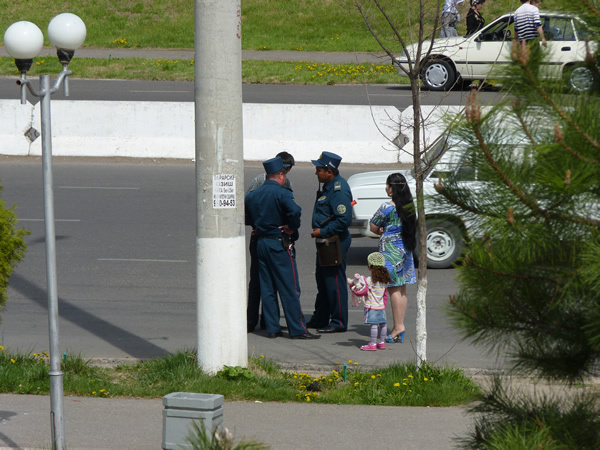 Wandering the streets of Tashkent we noticed the police kept stopping motorists to suppliment their meagre wages this was the accepted practise across the country. 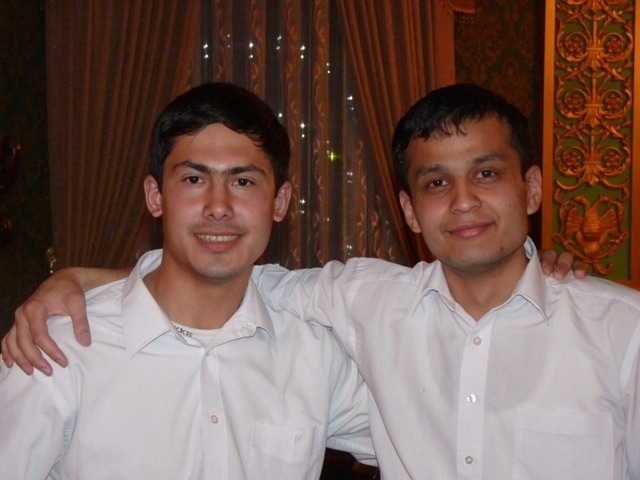 We made our way back to the Tashkent Palace Hotel by tube where everything was written in Russian or Uzbek. Photography was not allowed due to national security - nuclear shelters as someone around here MUST have WMD. The afternoon was spent by the Swimming pool. A couple of people braved the cold water it as had only been filled day before but at least we were clearly not all lined up for mass interrogation. Evening meal was going to be at a very highly recommended and reasonably piced restaurant which seemed to have disappeared (too successful?) 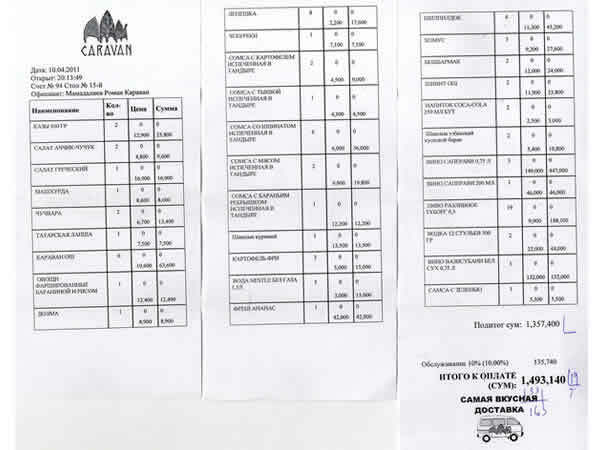 presumably it was no coincidence that we ended up at President Karimov's daughter's restaurant "Caravan" a 15 min taxi ride away = 10 taxi miles. A fairly average meal was rounded off with a massive bill, 1,493,140 So'm. 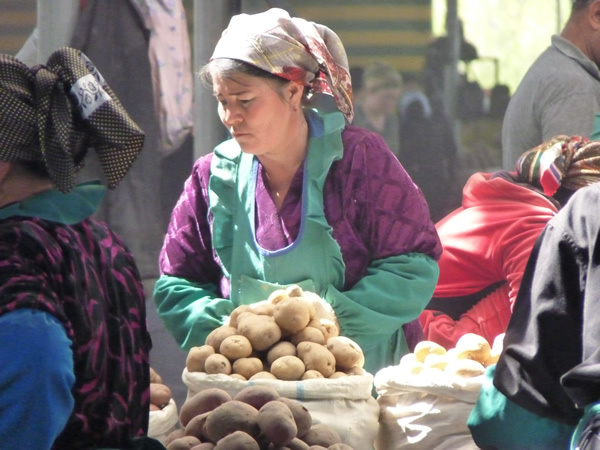 The expensive Georgian wine being the main culprit . 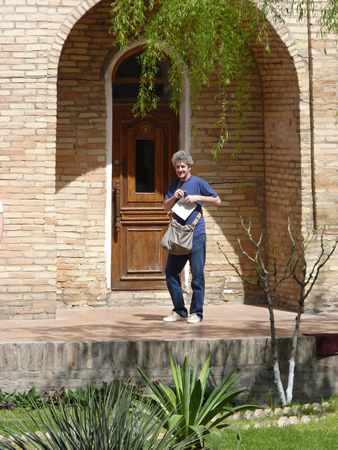 We trick & treated a US &/or Uzbek spy called Debbie (not her real name) as she was hanging around at the hotel. So there is such a thing as a free supper unless ... ? Taxis raced back to the hotel bar for no apparent reason. 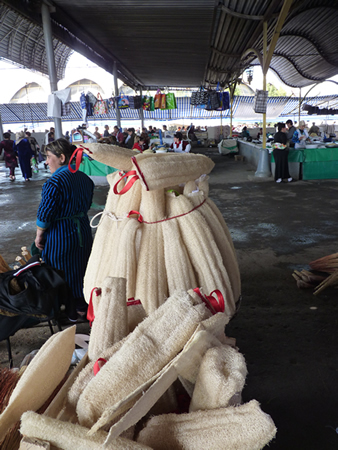 People were sporting a few purchases from the market. It was decided that boiling alive was out of fashion now and wearing tight hats and briefs would be enough to render the most hardened dissident but a special rendition of Gulnora Karimova singing might be over-kill. Early start for flight to Bukhara boarding passes had great seat numbers but it was sit anywhere as locals had priority boarding they got all the best seats behind the man with a gun presumably. Twin turbo prop Ilyushin 114-100. Comfortable flight and we arrived with all our bags. 10 minute bus ride to the hotel Caravan in the centre of old Bukhara just opposite the Ark (Emir's palace). Lovely, perfectly situated hotel around a central courtyard in which we could eat (if they hadn't run out of food) and drink. Wandered around spectacular registan, mosque, tower and madrassa then short nap before bus to ground at 2:00 for 2:30 with 3:00 kick-off. 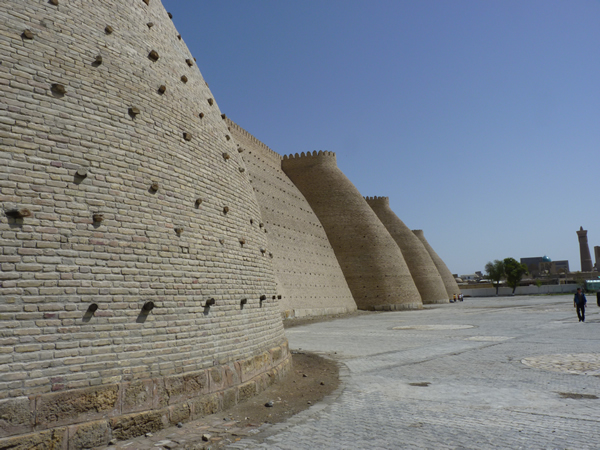 Morning wandering the streets of Bukhara and had guided tour of the "Ark" Emir's palace. Visited the bug pit where in 1838 Colonel Stoddart was thrown into for three years for not having the correct visa - clearly couldn't hack the 15 hour wait to get one! He was later joined by Conolly. The pit was full of dead bodies and human waste but additionally sheep tics which eat live human flesh were thrown in for good measure. Miraculously they survived before being freed but only to have their heads chopped off. 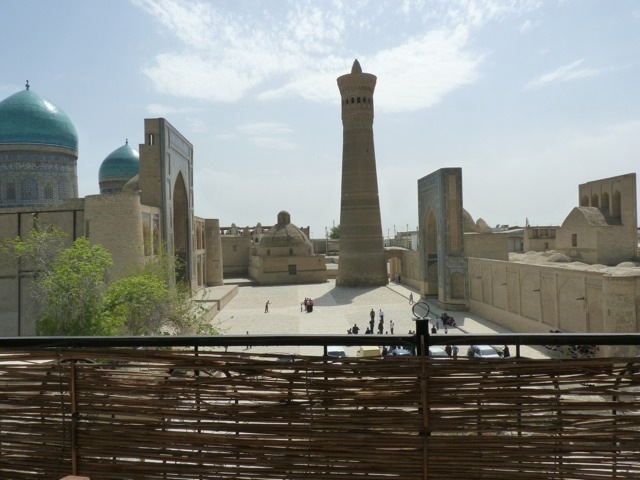 After lunch on the roof terrace restaurant overlooking the Registan we set off at 3:20 in the coach for Samarkand. After 20 minutes Will Ollard remembered he had left his passports at reception. When we finally set off at 4:00 we survived several hours of bone shaking as the roads are terrible. On arrival at the Sher Dor hotel we dumped our stuff and went to a restaurant a few yards up the road that we all sat outside. Usual food = no Plov. Upon returning to the satellite dish encrusted hotel to watch the Champions League match live at midnight the consierge asked whether that was local time or European time. He then failed to find the correct channel anyway. So beers/vodka in the courtyard instead. 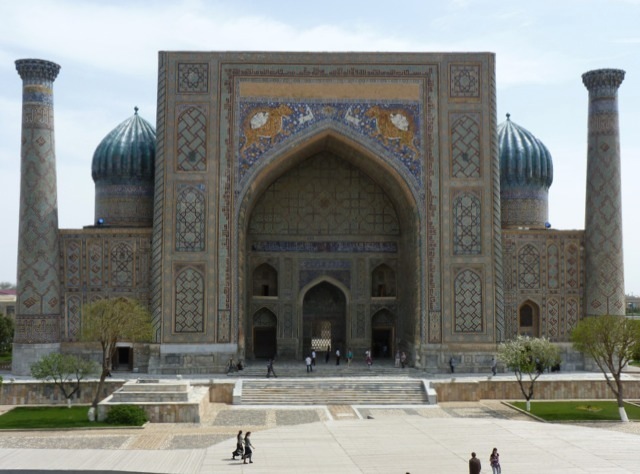 Samarkand is a bustling, sprawling city and much busier than anywhere else we had been to in Uzbekistan. Walking from the hotel through a park there were crowds of students enrolling for courses at the university. Everywhere I walked some girl would come up to try out her English: "Hello my name is Marthoona where are you from?""London? My sister is in London!". 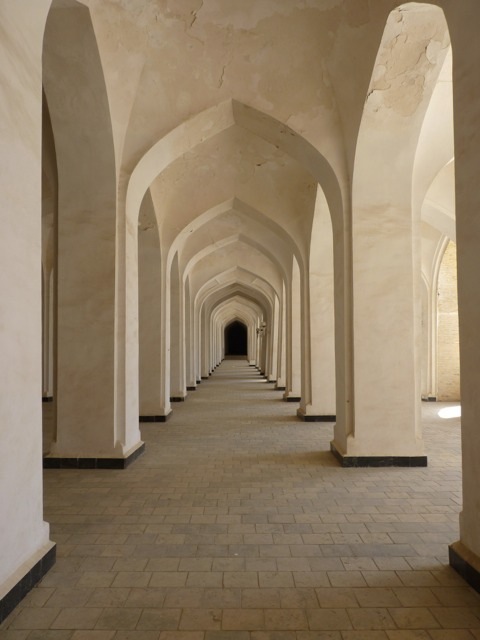 15 mins later there were the magnificent cathedral mosques of the Registan. Under restoration since 1930s it is extraordinary now to see how they must have appeared when ancient travellers on the silk road must have come across them and been completely awestruck like us! 11,500 Som lighter and we were in amongst them. 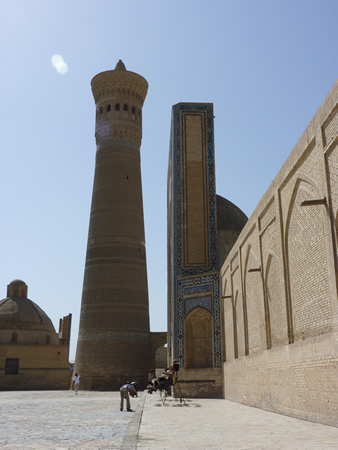 A policeman said we could climb inside one of the minarets for 5,000 Som. Good decision as we went up past the restoration of the cupola with the workers pulling up pails of cement with ropes. The view from the top was pretty good really. 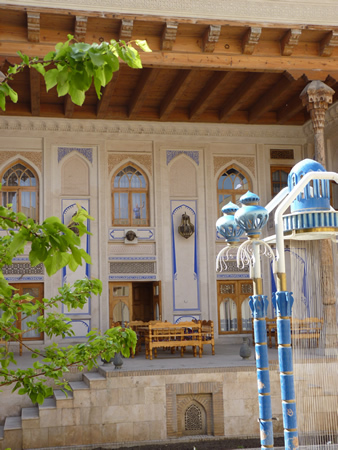 Over the road from the Registan there was a restaurant with upstairs terrace so lunch! 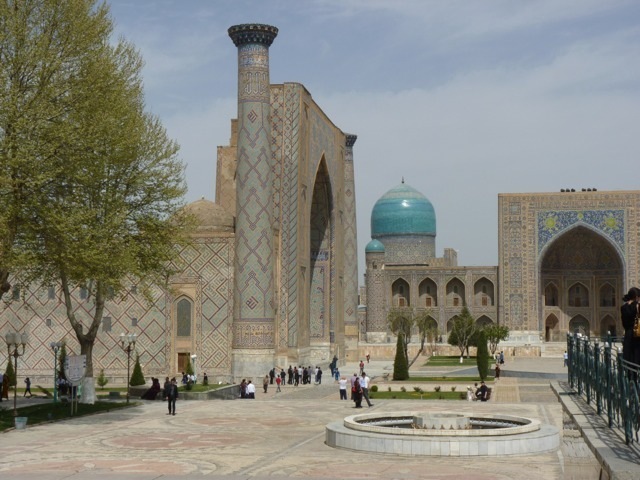 2:00 coach to the match was a tight schedule so we taxied back but due to a diversion had to go all round Samarkand. A patient Parry was there to greet us so we left at 2:20. A bit further than expected 40 mins drive and there was the pitch with stands full of excited school children who had come to inspect these strange aliens. Great pitch with a view of snow capped mountains. 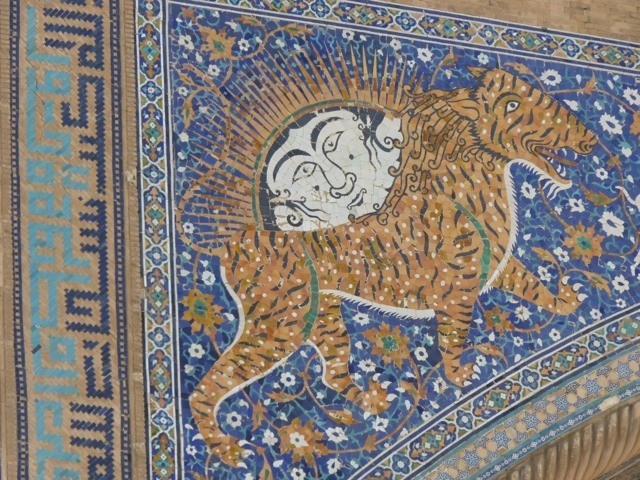 On return to Samarkand for showering and beers in the hotel courtyard the discussion about where to eat cropped up. The same place as last night was approved by the majority but those of us who prefer to try somewhere different marched off in a random direction. Suprisingly enough we found an extraordinary place to eat on Amir Temur Street. Great food (no plov), beer, vodka and amazing decor all for a very reasonable price. Thanks to our waiter Feruz for looking after us so well. Morning off to nurse hangovers and visit a few more sights before bundling into the coach at 1:30 pm for more bone juggling. Terrible road was littered with cardboard cutout Police cars presumably to prevent speeding but the roads were already a perfectly satisfactory deterrent. 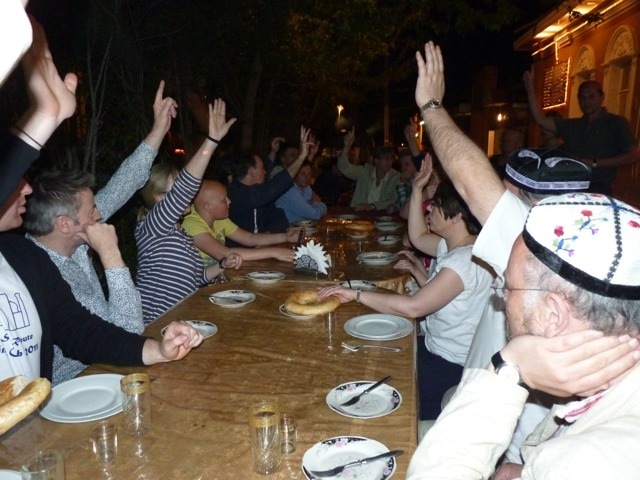 Returned to the Tashkent Palace Hotel at 7:00 ready to go out for the last supper. For the final team meal we walked out of the hotel with Britney (still not her real name) in tow again who assured us there were no restaurants anywhere near the hotel. A 5 min walk later we were in the restaurant in the park moving all their tables out onto their verandah. 22 people around one table was too much for the chef but beers and wine flowed (and vodka) whilst the chef struggled to chop up some salads for us and boil up some soup. These arrived at 1/2 hour intervals and eventually plates of chips arrived which would have been delicious had they been hot or even warm. The Kebab chasers were edible. Captain Chris Hough then announced the results of the ballot to determine "man of the tour" no surprise that the tour organiser, Simon won the coveted award. We all retreated to the hotel bar to agree what a fantastic tour it had been except for the football scores. 4:30pm flight to London meant we had the whole morning to have a quick shop and interview some brave local human rights advocates. The Market wasn't quite so pleasant in the rain. In April it apparently rains every other day. 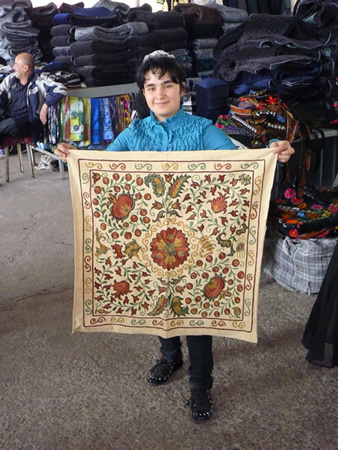 Rustam appeared to check that we left and the airport formalities were relatively swift once we had filled out another customs form to hand in with the one we had from arrival. 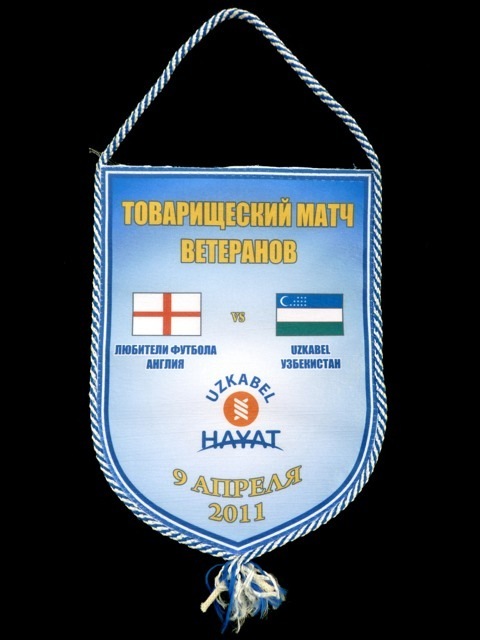 At Heathrow we had the longest wait of anywhere for the baggage handlers to "remember" there was a plane from Uzbekistan. Fabulous tour but generally agreed 3 games in one week is a tall order for old folks like us.